At the core of PowerDirector's famed ease-of-use is a design that bridges the gap between what you know how to do, and what you want to do-a design that trains you, but in a completely natural, unobtrusive way. With so much video now being shot vertically on mobiles, PowerDirector has added a new design mode that lets you upload mobile video for YouTube, Facebook and Vimeo by getting rid of those empty black bars. Express Projects is the fast, easy way for any video maker to quickly create professional-quality videos. PowerDirector makes it easy to create spectacular new 360?? videos using the same intuitive design tools you know and love. It's a whole new perspective on movie making. 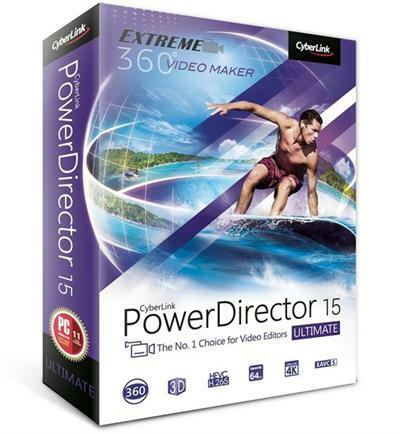 PowerDirector now supports complete end-to-end 360-degree video editing. Import equirectangular footage, create a 360 project, edit with a full range of design tools, then export in 360 format. Editing in 360-degrees opens up a whole new world of possibilities. Add titles and effects for viewers to discover as they explore your creation. Experiment with transitions, animated objects and more! Powered by cutting edge video rendering and production technologies, and supporting the latest video formats PowerDirector is ready to tackle any video project. The new TrueVelocity 6 rendering engine is a 64-bit powerhouse offering smoother previewing and significantly faster production than other consumer video editing software. Enjoy the latest and greatest formats and codecs like 4K UltraHD, AVCHD 3D/Progressive, XAVC-S and H.265. Smart Video Rendering Technology (SVRT) makes video production faster by analyzing your project and rendering only segments of footage that have been modified regardless of the clips' orientation. PowerDirector uses OpenCL acceleration on effects resulting in faster previewing and rendering as well as working with leading hardware designers to optimize performance for onboard and external graphics cards. Explore your creativity with a powerful collection of uniquely customizable design tools and the flexibility to highlight the very best of your work. All the tools you need to quickly and easily add impressive effects to your videos. PowerDirector's new Action Camera Center is a toolkit for every extreme video maker. Merge clips on different timeline tracks to create a huge array of eye-catching effects that will bring unique impact to your videos. Get that movie look instantly with rich, cinematic color enhancements to any video footage. Color Enhancement that intelligently analyzes video footage and optimizes hues and vibrancy, while protecting skin tone from distortion. Take your video productions to the next level with premium effects and professional grade video editing tools.